Jerika Lufrano flirted with the course record as she sparked Union Catholic to a huge victory over NJ #7 Governor Livingston, Westfield and Union Catholic swept team titles, Jonathan Mobisa of Union ran the fastest boys time, and Oratory won a thriller at Tuesday's Union County Conference Championships at Warinanco Park in Elizabeth. Lufrano continued her red hot junior season by throwing down an18:33 victory in the Mountain Division race as she ran away from 2016 Union County champion Victoria Vanriele of Gov Livingston and moved into the No. 2 spot in course history. Vanriele was second in 19:11. Only Katie McCafferty of Oak Knoll, who ran 18:30 to win the Union County title in 2007, has ever covered Warinanco's 3.19-mile dual meet course faster than Lufrano. Led by Lufrano, Union Catholic almost broke the 5-runner average and edged Gov Livingston, 27-37, for the team title. 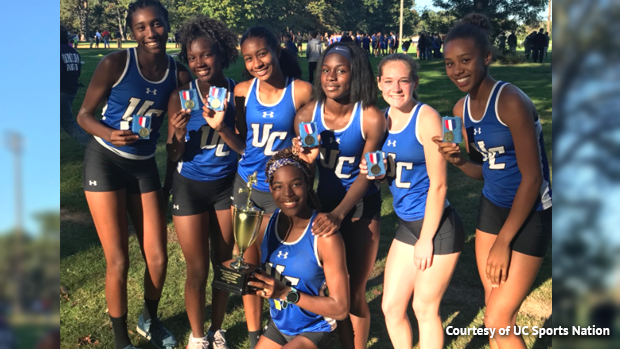 UC averaged19:45, just seven seconds off the course record average of 19:38 set in 2013 by Westfield. In the boys Mountain Division, Union Catholic outscored Summit 39-50, to capture the title. Rising sophomore star Max Russo of Summit crossed the line first in 16:31. Westfield also had a huge meet as the Blue Devils swept the Watchung Division titles. In the girls race, freshman Caroline Collins finished first in 19:42 to lead a 1-3-4-6-7-8-9 finish for NJ #9 Westfield, which averaged 20:22 rolled to a 21-40 victory over runner-up Scotch Plains. Collins won a great battle with Maddy Bord of Scotch Plains, who also ran 19:42 to get second. The Westfield boys, ranked No. 6 in the state, jammed its seven runners in the top 10 and had a 1-5 compression of 23 seconds on the way to a 26-53 win over Scotch Plains. Mobisa won the race in16:21, three seconds ahead of runner-up Westfield's Spencer Weigand. The best team race of the day came in the boys Valley Division when Oratory's No. 5 man Fernando Aviles finished in front of New Providence's No. 4 to give Oratory a 28-31 win over New Providence. Sophomore Christian Cadmus of New Providence won the race in17:10. In the girls Valley Division, senior Sydney Peng finished first in 20:07to lead New Providence to a 30-36 win over Oak Knoll. After they way they ran today, the girls matchup between Westfield, Union Catholic and Gov. Livingston at the Union County Championships on Oct. 25 at Warinanco could be epic, and Lufrano could take down McCafferty's course record.